Congratulations this week must go to our two 100 game milestone achievers, Rob Taylor (boundary) and Andrew Mitchell (field). Andrew umpired for 8 years and 150 games in the VFL before making the AFL list at age 30. He is certainly resilient and not even a shoulder reconstruction at the end of 2016 meant that he lost a game through injury. “I haven’t missed a game in 14 years due to injury,” said Andrew in an article for his 100th match. The highlight would no doubt be his first final in 2014. 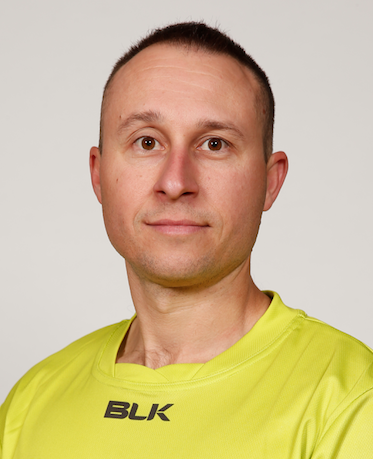 Rob commenced his umpiring in the Sydney football league in 2007 before making his AFL debut in 2012. Rob had to wait until Rd 7 for the privilege but he has enjoyed every minute of the ride. Rob was unfortunately injured in 2015 with a stress fracture of his foot and only got onto the ground for 10 games. He is now fitter and enjoying his footy more than ever before. Rob is now looking forward to his second 100! Our third milestone achiever is Mark Ensbey. Mark notched up his 50th game in his home town of Hobart. Mark is the only Tasmanian on the goal umpires list. He is coached remotely each week and maintains a rigorous fitness campaign with the assistance of the State League umpires and Mike Brown, the state umpires manager. Mark umpired his first AFL game as a replacement for Courtney Lai when he was injured in 2014. He was listed in 2015 and hasn’t looked back since. NSW based rookie field umpire was an interested onlooker at the MCG on Friday night. 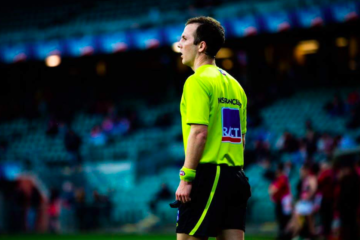 Cameron Barr was in Melbourne for work and put his hand up to sit on the Friday night as the emergency field umpire. He was back in Sydney however, bright and early Saturday morning for a 12 noon NEAFL game. Great to finally see Brent Wallace back in the AFL panel after a frustrating run of injuries on his calf. It was Brent’s first AFL game for the year. Interestingly Brett Deledio from GWS had a similar injury that only saw him return to NEAFL football two weeks ago. While talking about injuries poor Brett Rosebury can’t take a trick. He broke his hand at training last Tuesday and had a pin inserted in the break Thursday morning. Brett is hopeful of returning to umpire this coming weekend #hopeful#bloodinhisboots! NSW based boundary umpire Michael Baker is racking up the frequent flyers. He has umpired in Melbourne in two of the past three weeks. There is nothing like running at the G! Who cares whether it is the SCG or the MCG. While talking about frequent flyers, the Western Bulldogs v Essendon match at Etihad yesterday afternoon was labeled as the quickest game many experts had ever seen. Spare a thought for our boundary umpires who run about 17 kilometres each per game. The first quarter yesterday only had one stoppage, a boundary throw in and nine goals scored. Both teams worked through the corridor with relentless abandon. Congratulations to all involved with our two FM MDE participants this weekend. Callum Wells assisted our umpires in the WCE v Brisbane match and now wants to be a goal umpire. Rebeka Touzeau helped our umpires in the Pt Adelaide v St. Kilda match. Both had a wonderful experience. 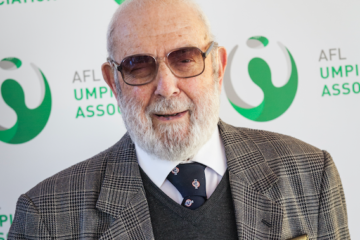 Our umpires in the Collingwood v Adelaide game wore black arm bands in recognition of AFLUA life member and two time grand final umpire, Leo Sutton who passed away two weeks ago.